This beautifully designed back to wall unit and wall hung pan is from Burlington's fitted furniture range. Create a seamless look by combining base and wall units and stunning Minerva worktops to any configuration to give the illusion of space and maximise functionality in your bathroom. 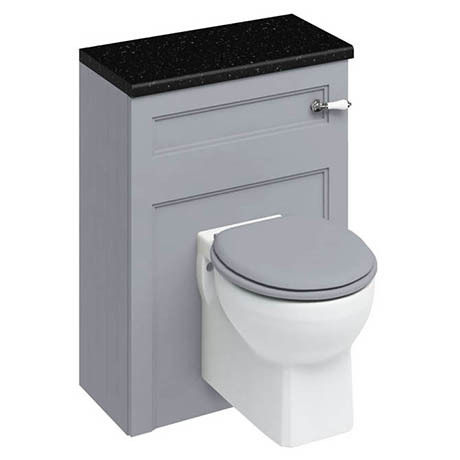 The unit comes with a dual flush cistern and lever and a removable front access panel for easy maintenence. All Burlington furniture is made using a dowel and KD screw joining system for exceptional strength. All units are primed with 5 layers of UV stabilised primer to minimise colour fading from sunlight exposure. A steel frame is included to support the wall hung pan. Comes with a 10 year guarantee. Please note: worktop and toilet seat pictured are not included and must be purchased separately.